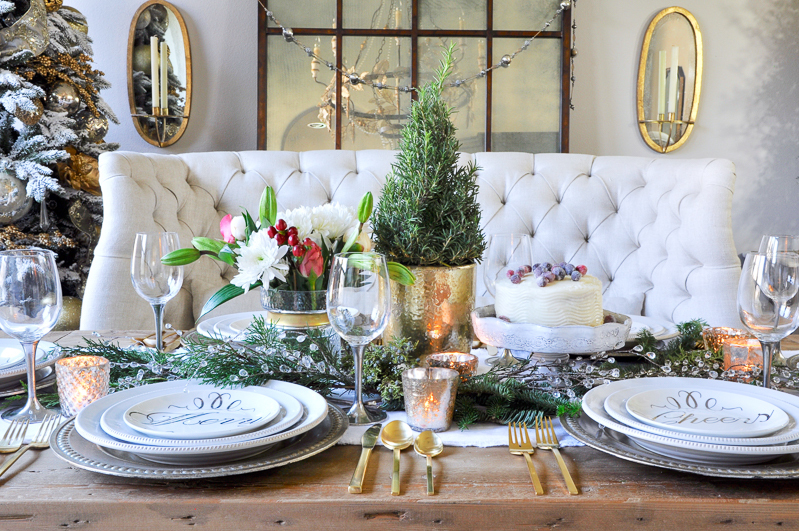 Hello and welcome to our Styled + Set Holiday Entertaining Blog Tour! I am excited to be participating alongside some of my favorite bloggers. For those of you visiting from Designthusiasm, welcome! Lory is our host and has gathered an amazing group. Hopefully, you remember my Thanksgiving Table which I shared with this same group. The links for all of the participants can be found at the bottom of my post. 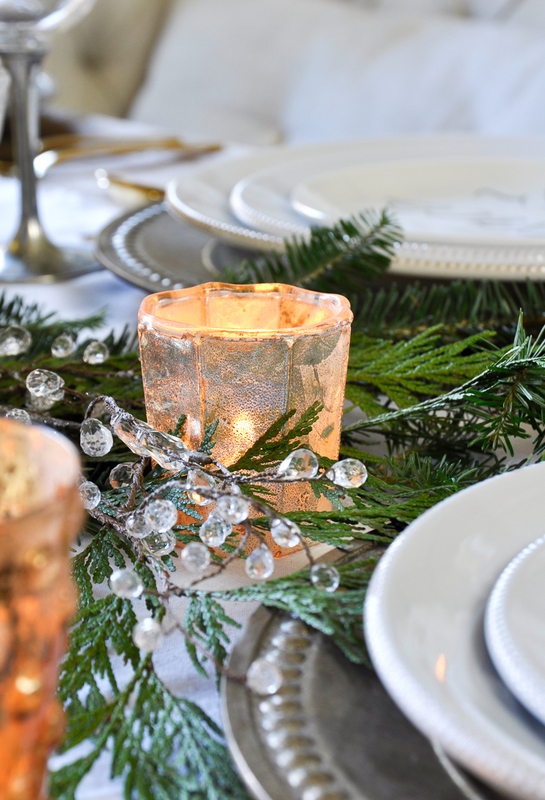 Today, I wanted to illustrate how to use traditional Christmas colors of red, green, and white, while still showcasing gold and silver on my holiday table. (This post contains affiliate links). 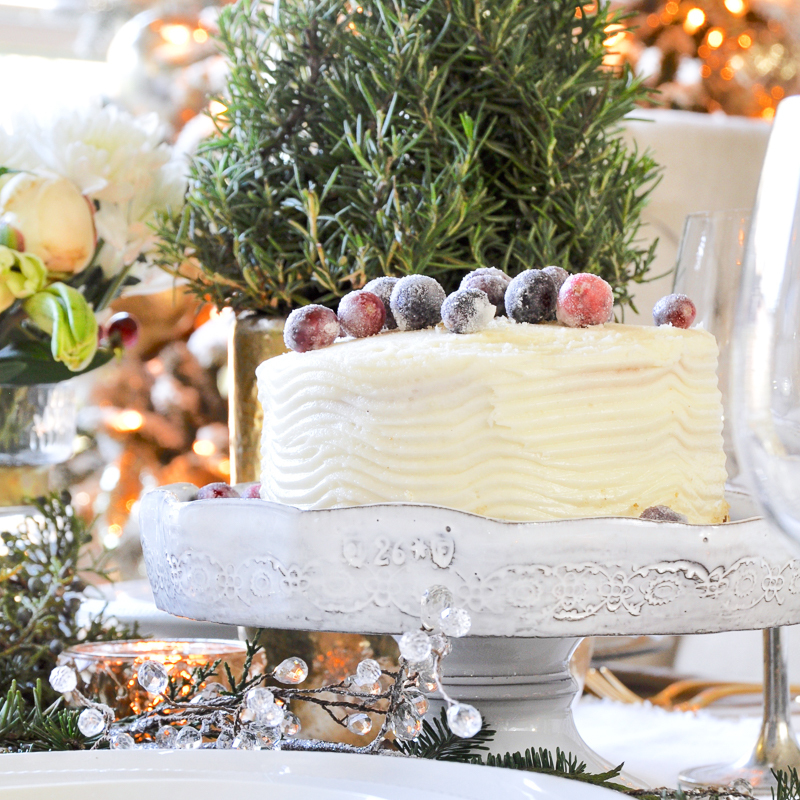 I found a wonderful store bought Italian Cream Cake, removed the nuts, and added home made sugared cranberries for that festive, holiday table appearance. You can see another one I decorated here. I like to use a cake stand to elevate my desserts. 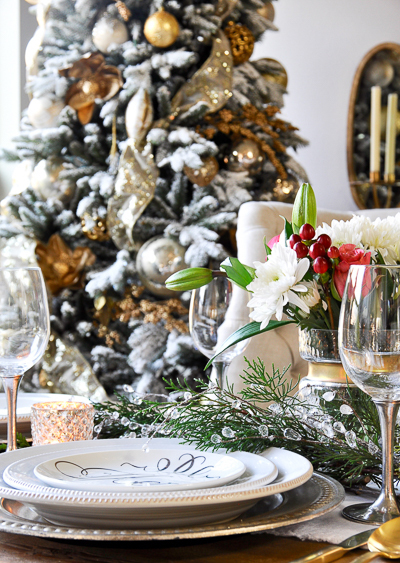 Keeping with the gold and silver color palate, the dinnerware and flatware work beautifully with the holiday table’s greenery as well as the Christmas Tree. 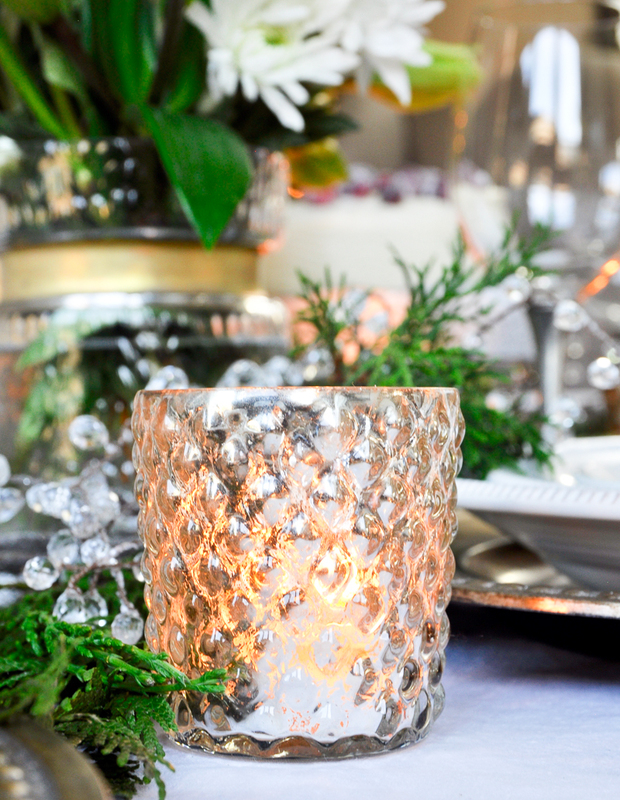 The pewter stemmed glassware elegantly compliments this holiday tablescape. The votive candle holders are filled with tea lights. 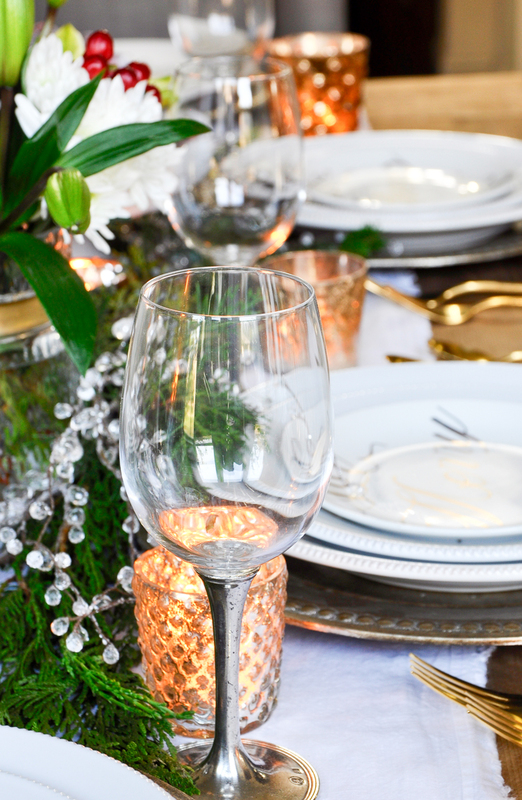 Their warm gold glow accents the table as you would want candlelight to do. 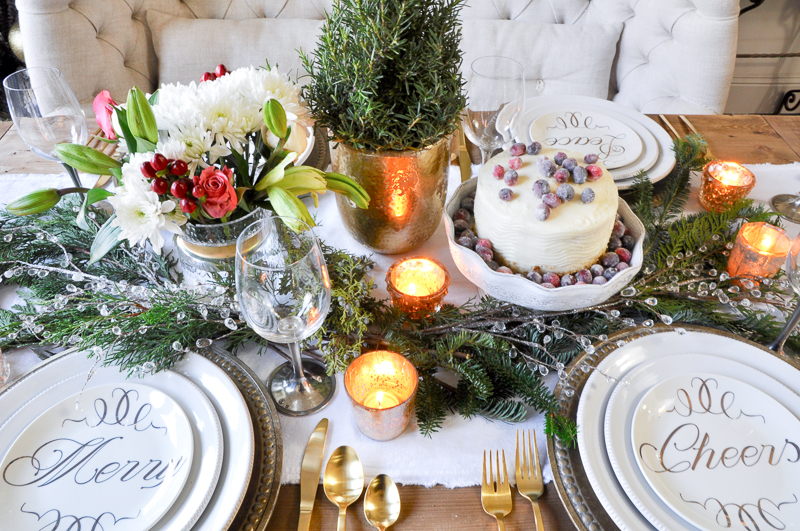 The red/white/green aspects are comprised of fresh pine garland, an amazingly scented rosemary tree, as well as a bundled holiday bouquet. 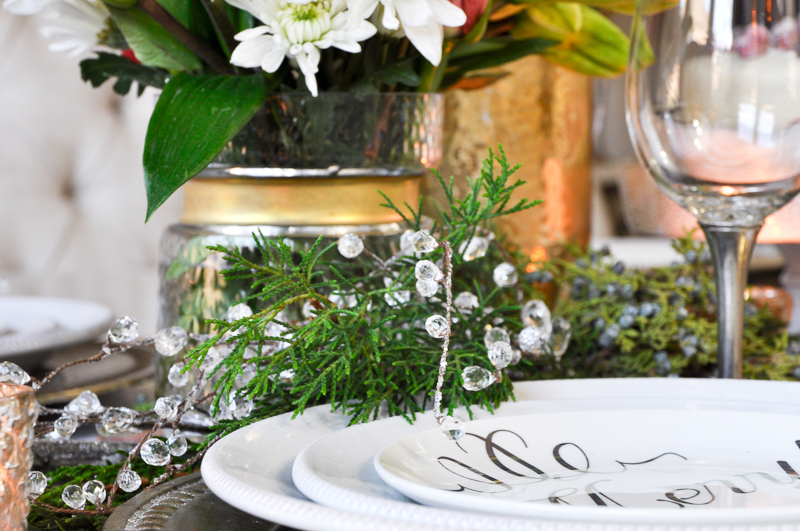 I added crystal sprays to the greenery on the table so it would look extra special. And here is the finished table. You can shop my dining room here. 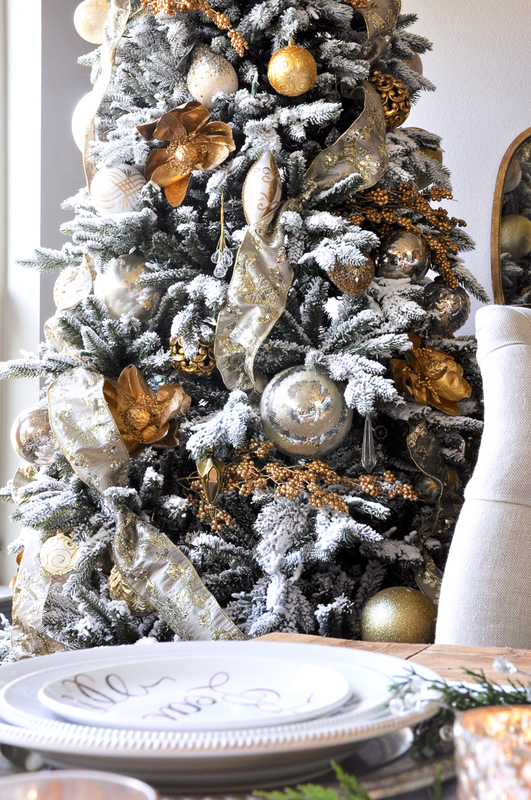 Before you leave, I wanted to offer a sneak peek of my dining room tree which I flocked this year using Sno-Flock. More on that soon! 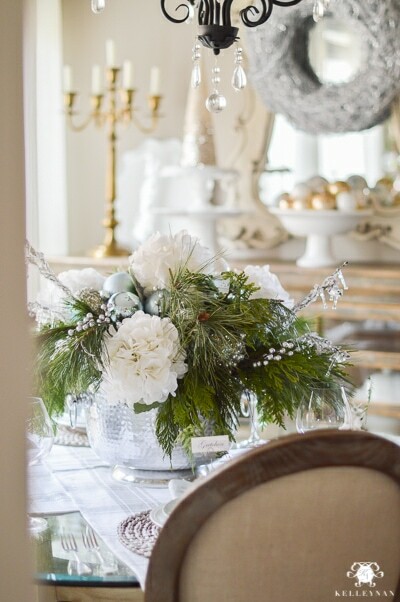 Be sure and check back next week when you will be able to tour my dining room as well as many other rooms in my home, each fully decorated for the holidays. If you have followed this blog for some time, you know I am anything but traditional. However, today I wanted to illustrate how “traditional” can be mixed with “non-traditional” when it comes to holiday colors and decor. So, don’t be afraid to mix and match in this regard. I bet if you try it, you’ll be glad you did. As always, I thank you for visiting. 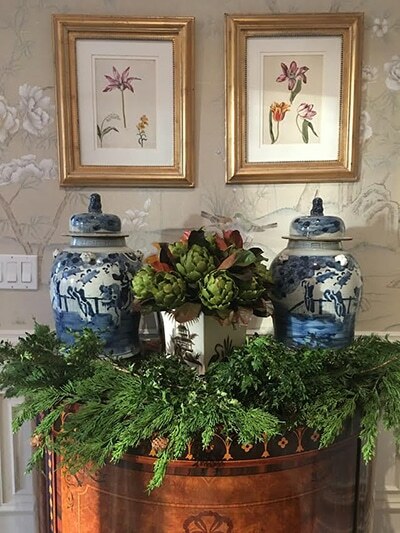 I realize you could visit a number of sites while you are online and I am grateful you have chosen to share some of your time here with me at Decor Gold Designs. I’d love for you to follow along on Pinterest, Instagram and Facebook. Your next stop is My Soulful Home. Jennifer, your table is just beautiful! The greenery and floral mixed with the gold is stunning, but I’m especially charmed by your cake! 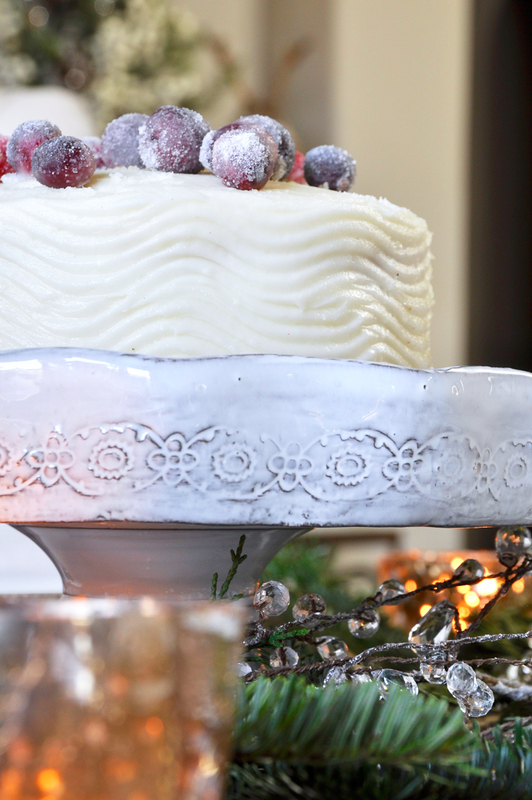 Love the idea of redecorating a store bought cake and yours is lovely! Wonderful cake stand, as well!! Thank you Lory!!! Store-bought is the way to go around here!!! 😉 Such a fun group…..I’m grateful to you for including me! Thanks so much Bree! I got those at my favorite seasonal decor store in The Woodlands. I’ll have to take you there soon! Ok well my favorite thing is the icy looking branches….it added a winter wonderland effect on top of the greenery. 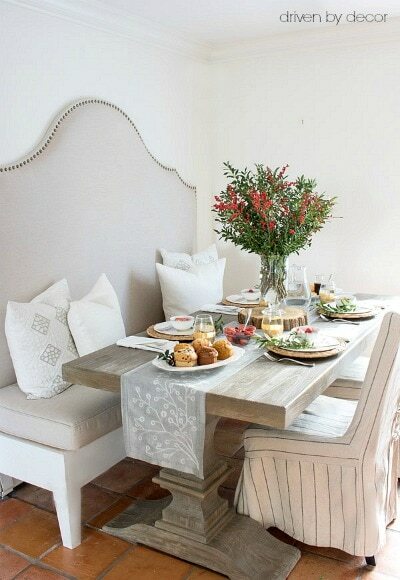 I love everything you do, and this table was stunningly beautiful! Absolutely beautiful Jennifer! 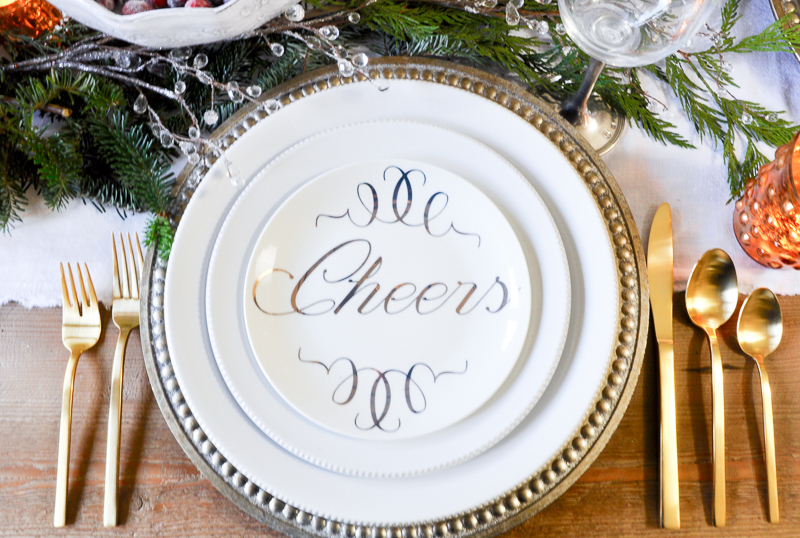 I love every votive, cranberry, plate and festive touch! Happy to be touring with you! Happy Holidays to you & yours! Jen, this is STUNNING! Seriously, it’s just so gorgeous! 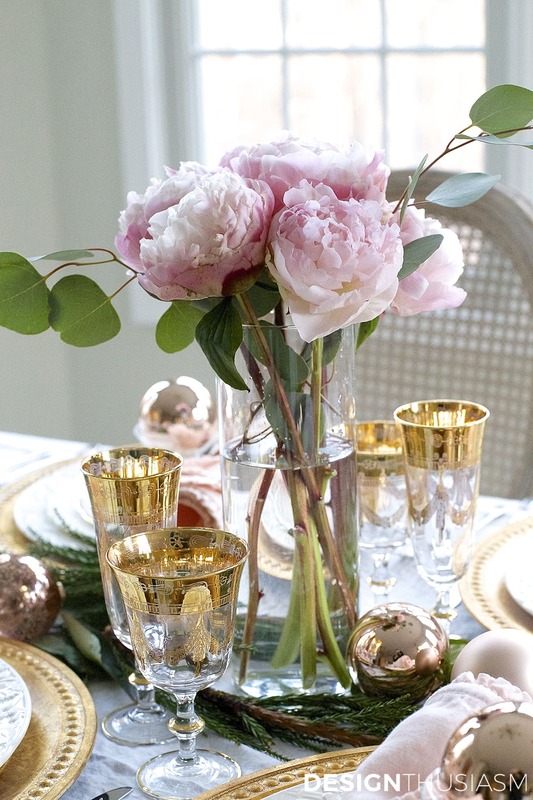 I need some of those crystal sprays in my life – love how they add a touch of elegant sparkle! Oh Jen you have done it again! Truly so beautiful, I loved the layered greens and floral centerpiece. Always an inspiration visiting you here friend! Awww….thank you so much Annie! I feel the same about you! Thank you Ann! What an incredibly sweet comment! Happy Holidays to you as well! 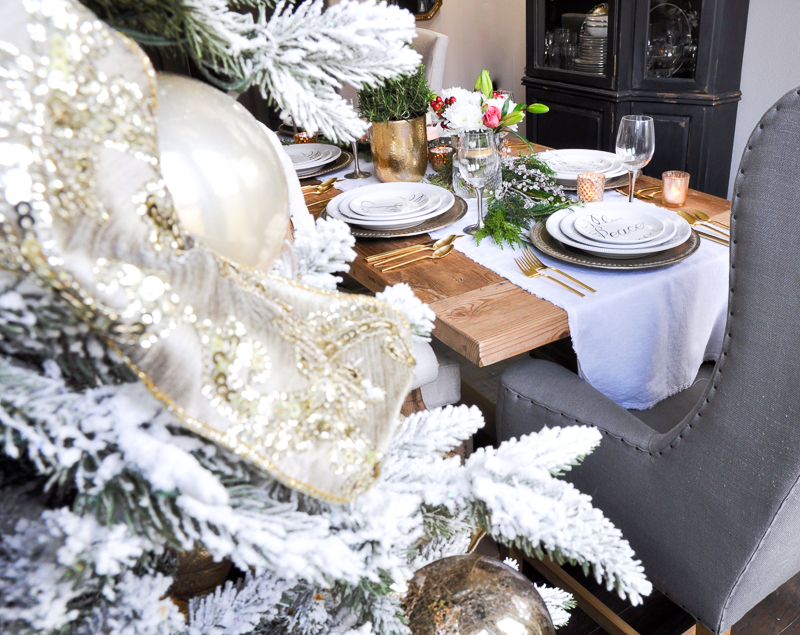 So elegant as always Jen….you set the bar for a stunning dining room! Good to know that I’m not the only lazy baker who redesigns store bought cakes! Beautiful table, Jennifer! 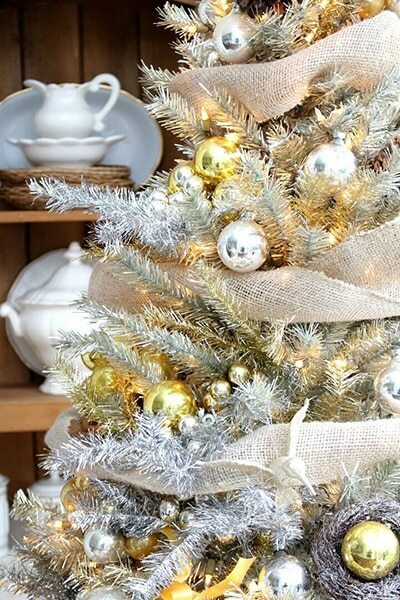 Your tree is amazing! Wow, I could stare at these pictures forever. This is amazing, so beautiful. The mix between traditional and modern is just don’t wonderfully. Wish my set up looked like that! Thank you Jamie! Your words are incredibly kind! Thanks so much for visiting my website! Wow, it’s just stunning, Jennifer! I love all these details!! This is absolutely beautiful Aunt Jenny! You’re so talented. Wow… that’s all I can say. 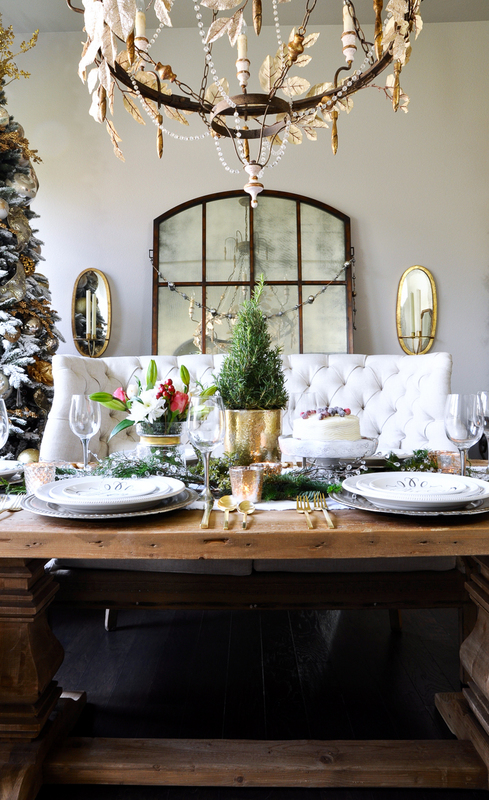 Everything from the table, bench, chandelier, tree, it’s all amazing.